Whether you’re totally new to vCita or an old-school user, you probably already know that our solution can whip any disorganized business into a top-performing, highly productive operation. As a company with roots as a small startup ourselves, we understand the day-to-day complications and time-consuming tasks that small business owners face. That’s why we love turning tasks like scheduling appointments, communicating with clients and collecting payments into simple, automated processes to make your life easier. Every module of vCita is designed to not only to save you time and expenses but to drive revenue and get you paid more. Curious? Below we’ve broken down six ways vCita can help you exceed your income goals each and every month. Chances are you already have a steady stream of traffic to your site, right? But how many of those visitors are turning into long-term, paying customers? The ultimate test of your business’ online presence is turning your website traffic into leads. The more often you can “push” your on-site visitors to book with you, the bigger your client base will be. And you can give your clients that same push in an instant with vCita’s LiveSite widget. This seemingly small but powerful tool does what so many business sites struggle to do: encourage their visitors to take immediate action. Beautifully designed to grab your traffic’s attention without interrupting them, the widget drives meaningful interactions with your business that lead to you getting paid. Seamlessly integrated into your site via desktop and mobile, the widget appears on each page of your site and is totally customizable based on your business’ branding. Whether you offer a free consultation or workshop, you can compel visitors to get in touch and turn your traffic into long-term clients. In short, it’s the perfect tool for enticing prospects to strike up a conversation. The easier you make it for those conversations to happen, the better for your bottom line. Business is nice, but repeat business is best. When clients keep coming back through your door, you have to worry less about scrambling for new business or chasing leads. And with all of us glued to our smartphones and various inboxes, email is still king when it comes to encouraging repeat business. 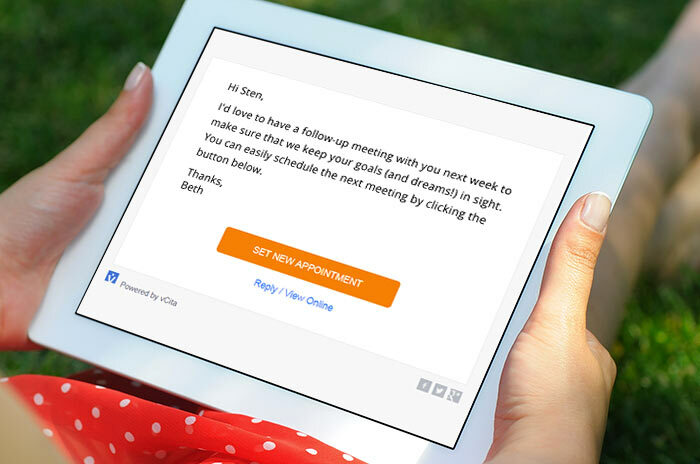 A simple follow-up email can make the world of difference towards transforming a one-off client into someone you see on a regular basis. That’s why vCita allows you to send personalized follow-up emails automatically. By putting your follow-ups on a weekly or monthly schedule, you can consistently reach out to past clients without lifting a finger. Automatic emails bring former clients back into your funnel without a second thought other than how you write your follow-ups. The key is writing emails that address your clients’ wants, needs and pain points. Since our messages are totally customizable, you can tap into your customers’ desires and put your own personal spin on your follow-ups. Carefully crafted emails like the ones you can send through vCita are a fantastic way to remind clients that you have their best interests at heart. As a rule of thumb, keep your messages positive and signal your commitment to change your clients’ lives for the better. You can’t effectively run your business unless you’re getting paid on time. Dealing with late payments month after month is essentially the same as losing money in the long-run. Hitting your income goals is next to impossible if you’re constantly scrambling to collect. That’s why vCita offers a variety of tools to collect payments quickly and efficiently. The ability to charge your clients’ credit cards in an instant is a game-changer. 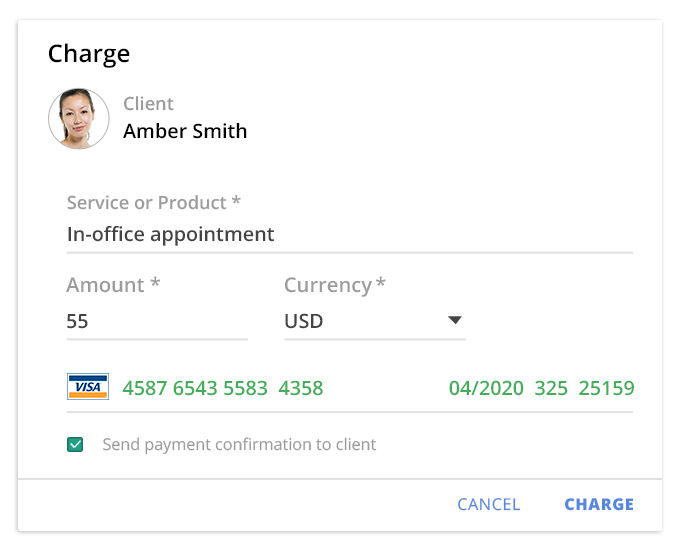 Not only does our virtual payment terminal allow you to collect payments from your laptop or via smartphone, it also allows you to charge clients on the spot. This means that any small interaction or conversation with a client is an opportunity for them to pay up. Also, you can charge clients for both past and future services, saving you time and energy down the road. Having a dedicated payment terminal is also a big winner with clients who are suspicious towards online payments. We all work with someone who’s a bit “traditional” or doesn’t want to deal with typing their credit card information into an online form. With a dedicated “back office” solution, you give such clients peace of mind as they know their personal information is safe. Getting paid online means getting paid fast, plain and simple. No back-and-forth, no dealing with accounts. Just money in your pocket sooner rather than later. 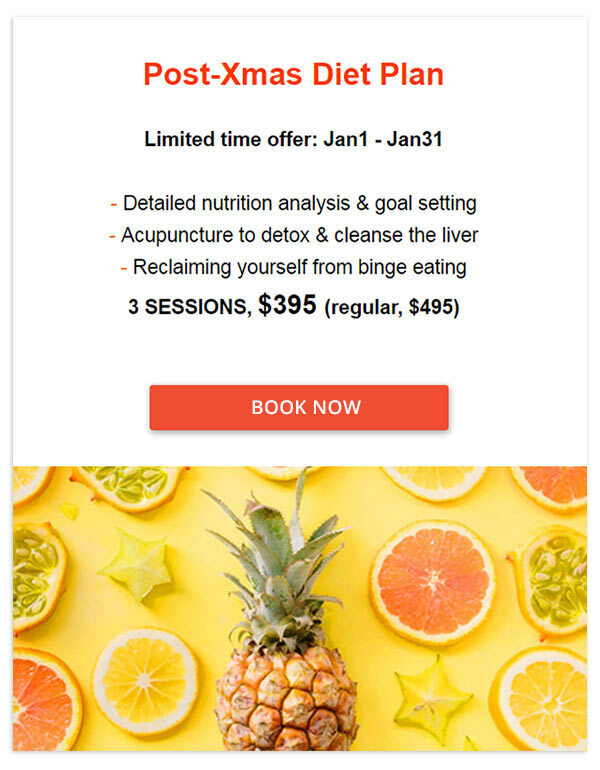 Emails are ideal for keeping in touch with current clients and reconnecting with past ones. We understand the value of your business’ emails, which is exactly why we decided to integrate in-platform email marketing to help our users win over more clients with their messages. Want to update your clients on your latest services? Check. Need to remind your list of your new business hours or upcoming vacation? Check. Just want to say “happy holidays?” You got it! But the real strength of vCita’s email platform is how easy it makes it to close deals with clients. What separates our email marketing solution from the pack is that it allows you to see – in real time – how many clients made good on your offers. Each email campaign you send through vCita has a built-in call-to-action button (“Book Now!”, “Join My Workshop!”) to entice your clients to respond immediately. When clients click on the call-to-action button, they’ll instantly land in your services menu and will be able to complete the scheduling or registering action in a matter of seconds. vCita does the legwork for you by tracking your client’s journey. Each and every step they take is tracked in your email campaign dashboard. You’ll always know just how effective your emails were and how many appointments they generated. As a result, you can fine-tune your own campaigns over time to streamline your business’ email marketing campaigns. The best part? You can create email & SMS campaigns anytime, anywhere from both your desktop and smartphone. So whether you have an instant update to share or want to schedule future campaigns – you have a powerful marketing tool in your pocket, ready to fire away just when you need it. There’s a reason why online coupons are the bread and butter of today’s small businesses. The right coupon can turn a simple client interaction into a totally irresistible offer. We live in a coupon culture where scoring a good deal is practically an obsession and businesses should capitalize on this craze at every turn. Based on what we know about buyer psychology, providing frequent deals both gives your clients a rush and provides them a compelling reason to come back through your door. Everybody wins! vCita’s Coupons feature helps your business find fresh ways to reach out and stay relevant to your clients. You can create, distribute and track your very own coupons like a total pro. What’s awesome about our Coupons feature is that there’s no steep learning curve involved. We believe that just about anyone can create a successful coupon within our platform, it’s really that easy. Whether you want to create coupons for special occasions like Black Friday and Christmas or want to integrate coupons into your routine marketing activity, we have plenty of ideas to get you started. 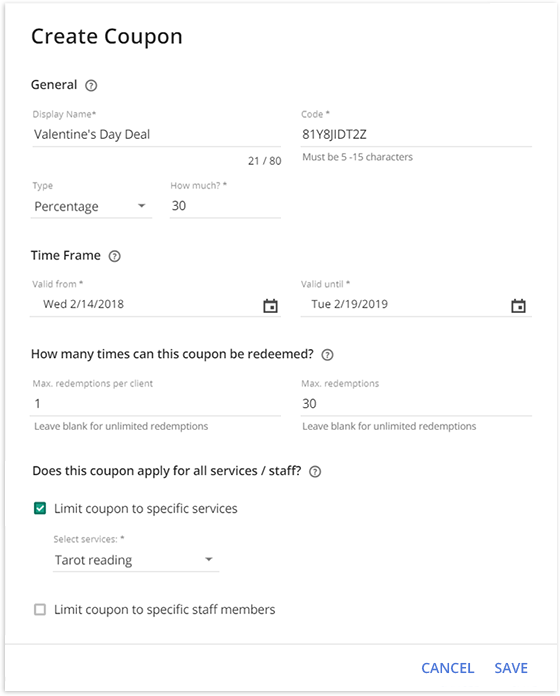 Check out this great article on 5 tried-and-tested coupon templates to get inspired and boost your bookings! If there’s one thing just about any business owner can agree on, it’s this: no-shows and last-minute cancellations are the worst. Sure, they might come with the territory of being a small business, but that doesn’t mean they don’t sting. It’s especially irritating when you don’t have time to fill those gaps in your schedule and your earning take a hit as a result. It’s in those moments when clients are at risk of disappearing that vCita’s SMS appointment reminders truly shine. With the right reminders on deck, you can minimize lost time, lost money, and no-shows automatically. Instant reminders represent another smart safety net for business owners looking to boost their bottom line month after month. 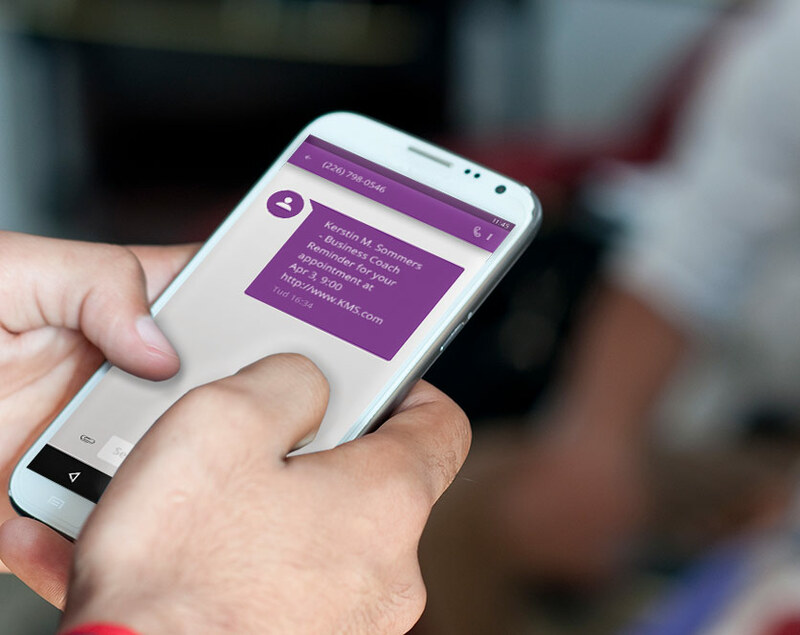 By far one of our most popular features, SMS appointment reminders ensure that your schedule stays filled and keeps your clients in the loop. Are You Ready to Boost Your Monthly Earnings? Now that you’re totally fresh on what vCita has to offer, are you using our solution to its fullest potential? We love to help our clients grow their bottom lines in any way we can, and these six features can help you do just that right now!